While I was able to pass the exam on my first attempt, many people do not, and I completely understand why; this is not an easy exam! 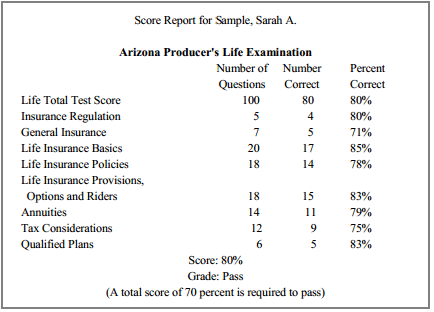 The state exam is designed to push the test-taker to the point of second guessing his or her understanding of insurance. It asks questions in a way that requires you to understand each concept that you learned during your preparation, to discern similar concepts and minute details from one another, and to stay focused for the entirety of the exam. 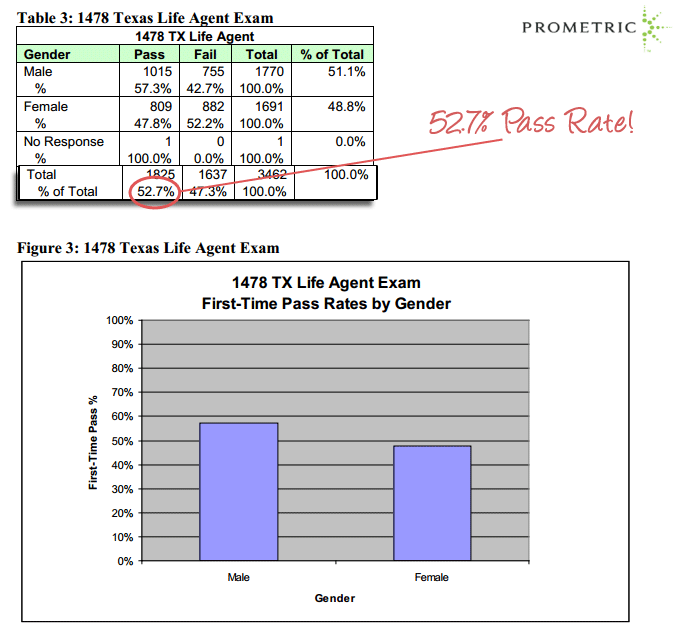 Now I understood why only 50% of the employees at the agency who sat for the exam where able to pass. But, is this a national trend among all life and health insurance exam applicants? The answer is yes. 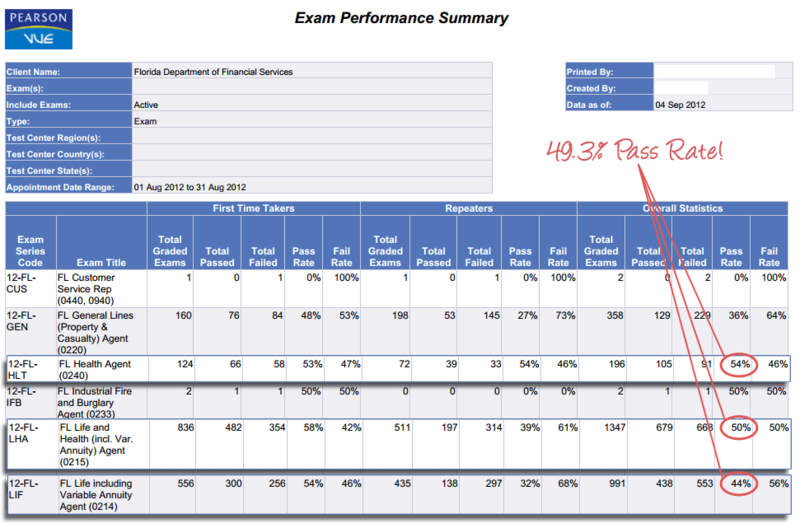 The illustrations below display the overall pass rates for test-takers in Florida and Texas, for a period of one month. While pass rates continuously fluctuate and are different in every state, this average is often constant between 50% – 60%. This means it is not the end of the world if you do not pass your state insurance exam. Even if you have a strong understanding of the concepts found on the exam, the exam itself is still difficult. In the event you did not pass the insurance exam on your first or second attempt, do not let this discourage you. Those who pass the exam with little effort are not always the most successful in the industry. In fact, many of the agents at the agency that initially struggled to pass their exam went on to be some of the most successful agents I know. Also, if you fail your exam by only a few questions, this is a GOOD thing because it shows that you understood the majority of the information! Stay Positive. Upon completing your exam you should have received a printout of your results from the testing center. This printout illustrates your overall performance as well as details each section of the exam. Let this printout guide you, just as the State Exam Outline, as to which sections contain more questions on the exam and where your emphasis of studying should be placed. However, do not ignore those sections on which you performed well. The trick is to continue studying right where you left off and to retake the exam as soon as you are prepared while everything is still fresh in your mind. The last thing you want to do is put your studying on hold. Every day you do not review a concept, the more likely it will be forgotten. In addition, every insurance exam will be different from the next, so those sections on which you scored well will likely have slightly different questions on your next exam. Review your exam – Many states will allow you to review your exam along with your answers. This is great because it allows you to take your time and get a better understanding of how questions are asked on the exam. Best of all, it does not require any type of fee. You must contact your testing administrator within 90 days from the date you completed your exam, and you only be allowed to review it once. Understanding the material well enough to pass the state insurance exam is one thing, but you also need to understand how to take the insurance exam. Some test-takers feel the exam is deliberately tricky or includes information that they have never seen. Because of the amount of information that is covered on the exam and how detailed the questions may be, this is a common notion. As explained in Top Insurance License Exam Tips, there are many things to look out for on the exam, such as understanding what a question is asking, double negatives, pre-test questions and more. What do you think? Do you feel the exam was too difficult? Share with us below!